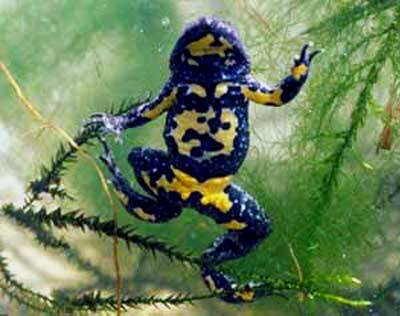 The Yellow bellied toad doesn't exceed 5cm and is easily recognisable by its brightly coloured underside, limbs and throat which are yellow with black marbling. The back is from greyish brown to greenish brown and is warty, the eyes are protruding with a pupil more or less triangular or heart shaped. The digits on the front legs are not webbed, whereas the digits on the back legs are almost totally webbed. 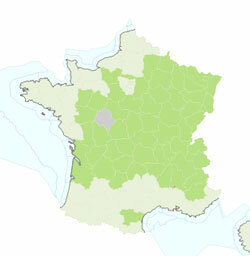 Its main range in France is between a line drawn from Loire Atlantique to Ardennes and a line drawn between Vendee and Côte D'Azur giving a more or less triangular area. Its habitat comprises ponds, lakes, ditches, canals and slow moving rivers, it is generally aquatic and rarely strays from the waterside. It preys on worms, molluscs, small crustaceans, insects and their larva, occasionally spiders. 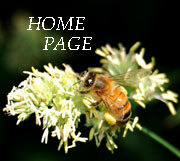 It is generally gregarious and often lives in small diurnal groups. When threatened it turns over on its back and exposes its coloured belly as a warning to a predator that its flesh is not edible. The males sing both day and night, as they do not have a vocal sac the sound does not carry very far. Coupling begins in April and continues until July or August depending upon altitude and temperature. The female lays about a hundred eggs in the aquatic vegetation and the development of the young is quite rapid being complete within three months. 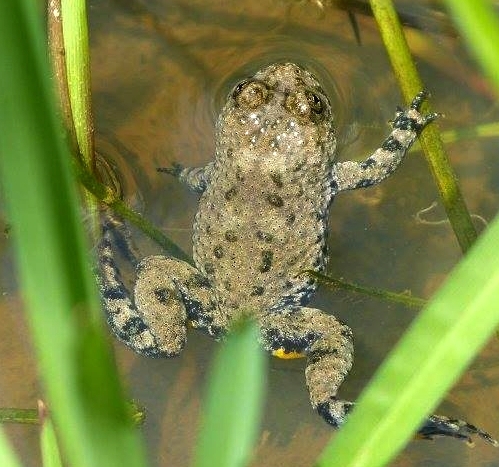 It has a close cousin which is to be found in Eastern Europe, the fire bellied toad Bombina bombina and although this species has a completely different mating procedure and the fire bellied toad has vocal sacs the two species interbreed where they are both present. The offspring can resemble either species and are fertile themselves and able to reproduce. It is considered vulnerable / endangered in France and benefits from fully protected status.